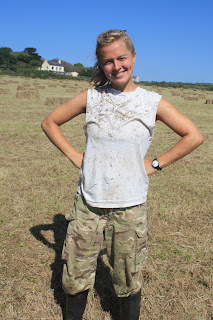 Marie, from France, has just left the farm this morning after three weeks wwoofing. Many thanks to Marie for all her hard work on the farm, and all the best with her onward travels. Marie on the right, sowing broad beans with Kelly. Saturday 27 - St Just food and craft market, Old Town Hall, 09:30 - 12:30. Sunday 28 - yoga workshop, on the farm, 16:00 - 17:30. 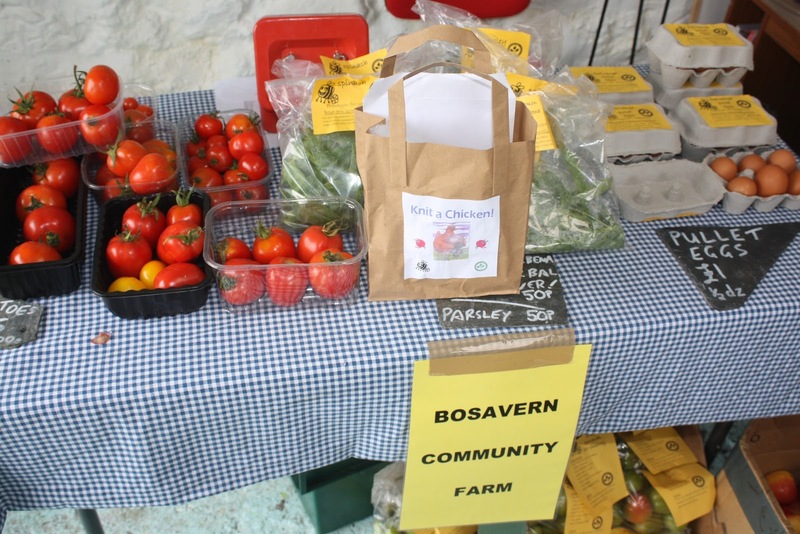 Saturday 3 - Pendeen farmers market, Centre of Pendeen, 10:00 - 13:00. 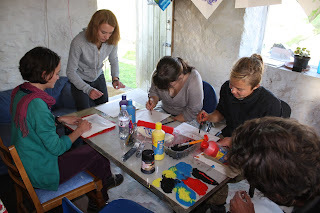 Saturday 3 - Spanish workshop, on the farm, 17:00 - 18:00. 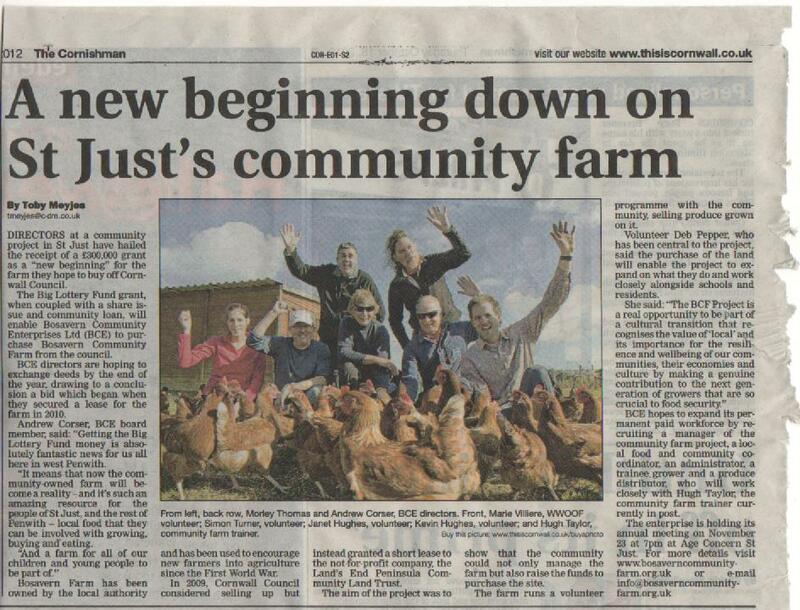 Sunday 4 - a group of volunteers will represent the farm in the annual Feast Parade, St Just, morning. Sunday 4 - Farm Feast, on the farm, 14:00 onwards (farm volunteers to each bring a dish to the farm, for a sit-down sharing meal). Monday 5 - Hugh to give a talk at Ludgvan Horticultural Society entitled "The Growing of Bosavern Community Farm", 19:30 - 20:30. Many thanks to Nick and Helen and all the team at the Apple Tree Cafe near Sennen for their lovely apple day celebrations on Sunday. The farm ran stalls selling eggs, herbs, veg, and of course apples, both inside and outside the cafe, and promoted our veg boxes and Christmas turkeys too. 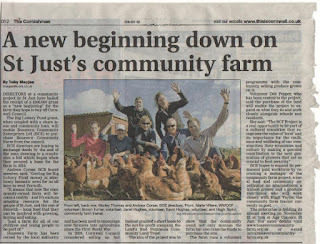 The farm donated a veg box to the raffle, and the raffle raised £21 to buy the cafe's second lot of Community Shares. 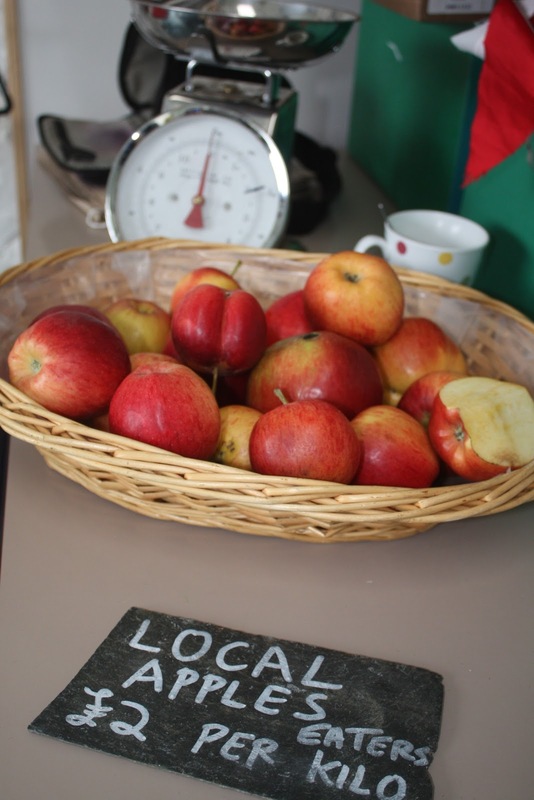 The Apple Tree Cafe buy some of their salad leaves from the community farm, and also buy other produce from us, such as green tomatoes to make chutney. We buy the bread for our veg boxes from Nick at the cafe. Now they have offered to be a pick-up point for our veg boxes, so that people in Sennen and the surrounding area don't have to drive up to Bosavern to collect their boxes at the weekend - so if you live in and around Sennen and the cafe, and would like to pick up your veg box from there, please give us a ring on 788454 to arrange it. 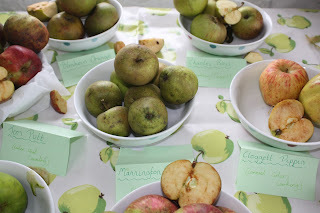 Apple varieties from the local area. Our stall inside the cafe. 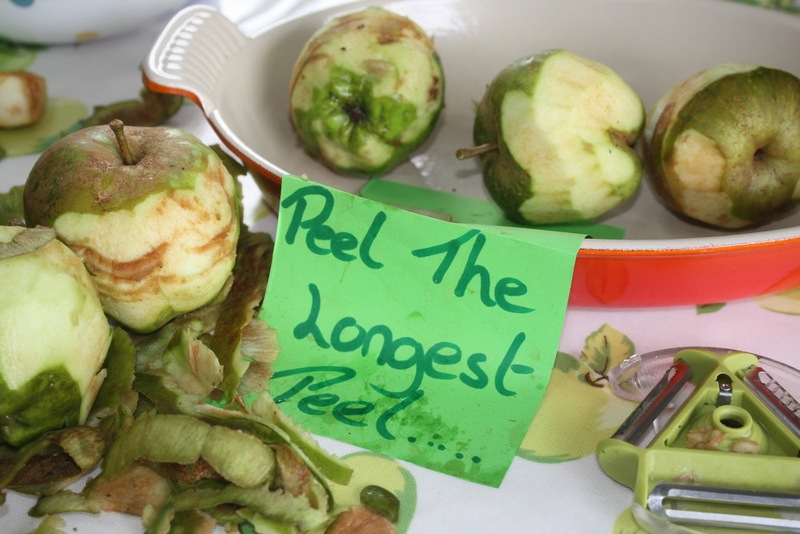 One of the apple-themed activities on offer. Selling apples on our stall. 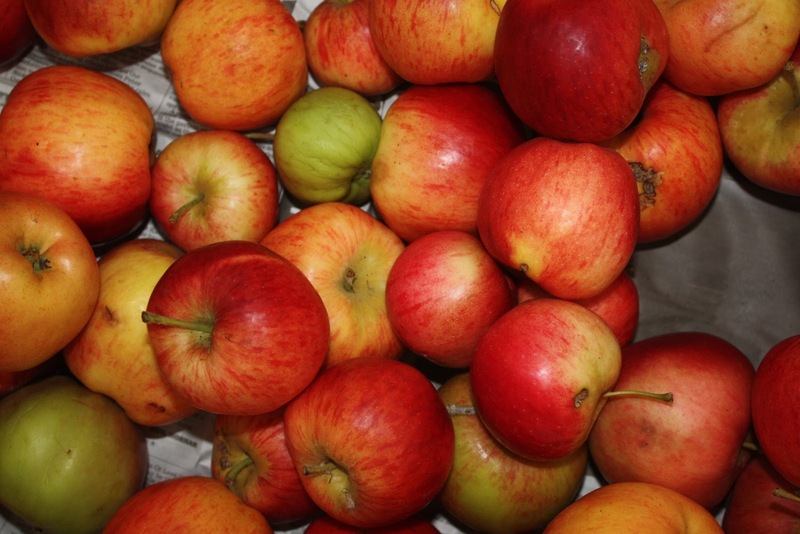 The apples we buy from a friend near Pendeen. Sowing broad beans, third time round. 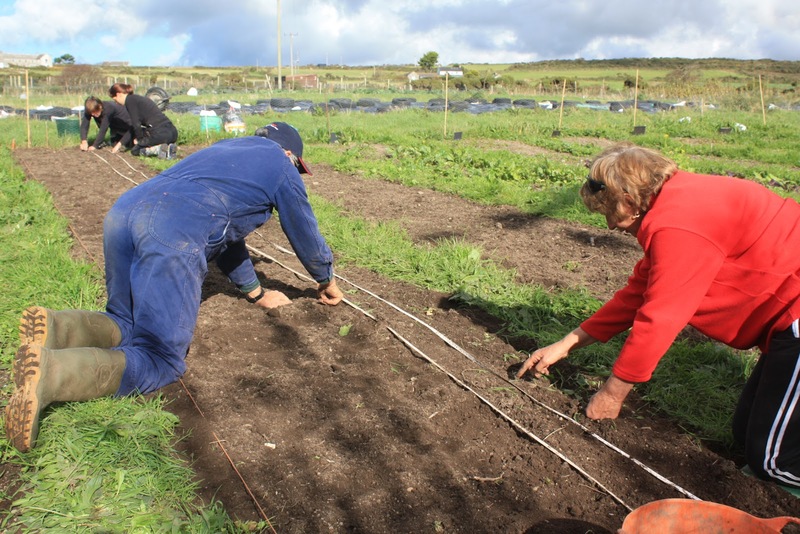 Last Saturday (20th October) we sowed the first two beds of broad beans for next year. The second bed we ever prepared outside was for broad beans, in November 2000. 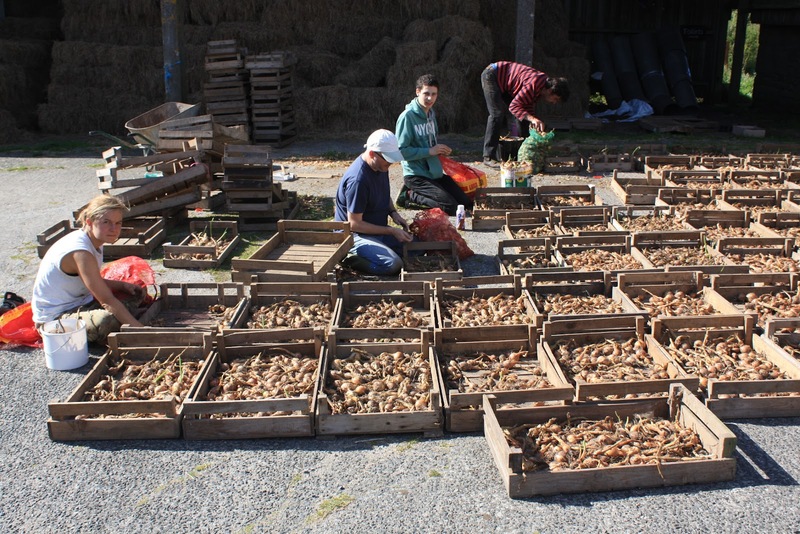 So here we are again, preparing for our third full growing season on the farm, and the future is bright! Sowing broad beans - Kelly, Marie, Kevin and Janet. All three of the weekends workshops went well. The Spanish workshop ended up in the polytunnel learning the names of crops in Spanish, while some funky chickens were knitted later that day, and seven people came to a very relaxing yoga session on the Sunday. Thanks to all those who led these sessions. 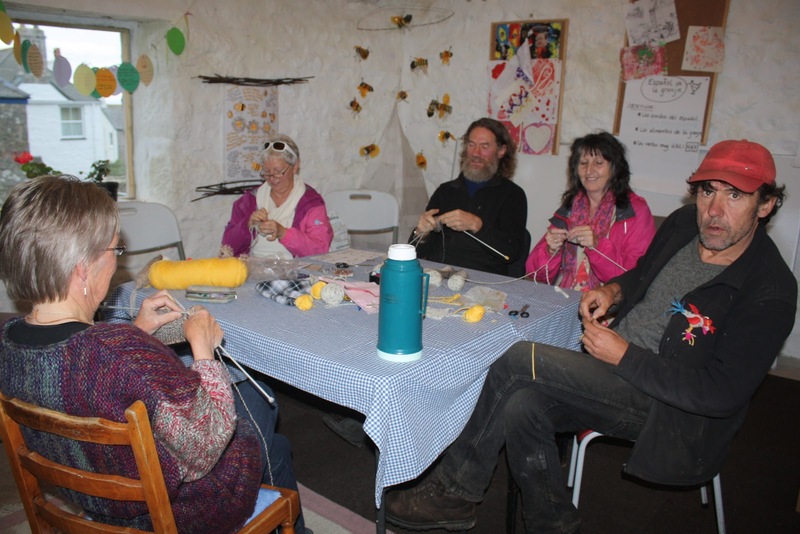 The "knit a chicken" workshop in full swing. The next Spanish workshop will be this coming Saturday 20th at 5pm, then there'll be a singing workshop led by Kelsey at 7pm on Monday 22nd. What's for sale on the gate stall? Plus free "Positive News" newspapers. Our gate stall is open from dawn till dusk, seven days a week. Apple day at the Apple Tree Cafe. Celebrating National Apple DayCome and join us whatever the weather! 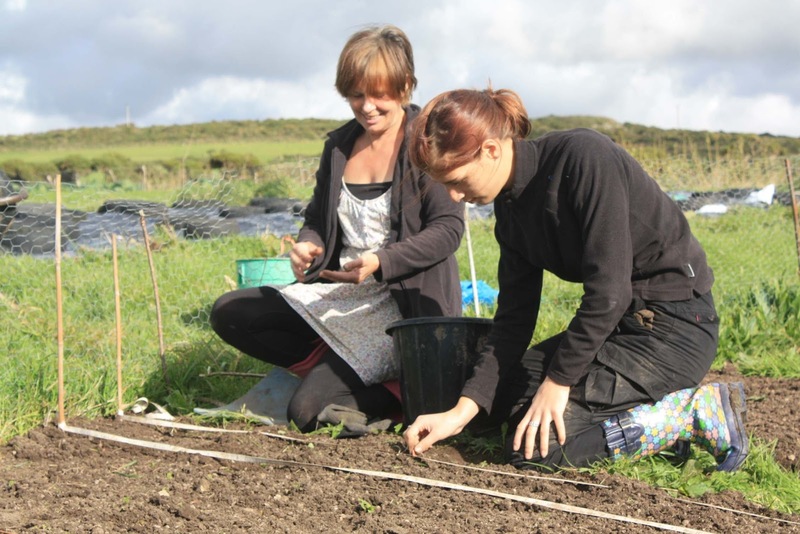 Many thanks to Lisa, from Germany, who spent two and a half weeks as a wwoofer on the community farm - we hope you're enjoying the wet weather in Newquay and not missing the piglets too much! 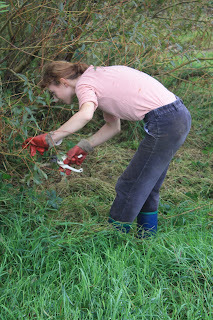 Lisa in action clearing brambles beneath our willow coppice. It's been a funny year for farming. Our tomatoes didn't fully get going until September, but we've had two months of good crop, although next week looks like being the last. Tomato blight was seen in the polytunnel at the beginning of July, and has been a constant battle since. Rots also began soon after that, due to the incredibly wet summer. Trusses have rotted, so we have removed the tomatoes and disposed of the branches, leaving us with plenty of green tomatoes to make chutney out of. Having already brewed enough for the house over winter, some of our volunteers cooked up a big batch to sell on our gate stall. Delicious green tomato chutney is now available at the gate, priced £2 for a medium size jar, and £2.50 for a large. 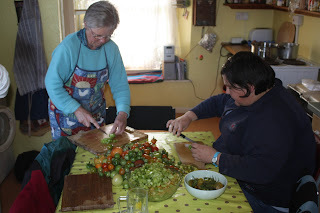 Jenny and Anne preparing chutney in the farmhouse kitchen. St Just Food and Craft market. The new food and craft market is held in the Old Town Hall (near the Methodist Church) of St Just on the second and fourth Saturdays of every month, from 09:30 till 12:30. This year we have started to save some of our seeds to grow crops from in the future. So far we have saved "Green in Snow" mustard, purple sprouting broccoli, "Red Russian" kale, a mystery kale that sprang up on its own (probably left over from the previous tenants), "Ambassador" peas, and "Meteor" peas. 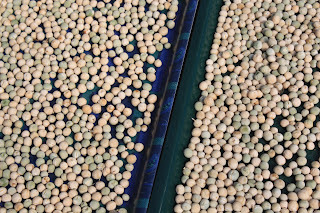 Peas drying in the polytunnel to provide next year's seeds. Not only does seed-saving reduce the money we spend on seed, it allows us to reclaim this process from seed companies/corporations. 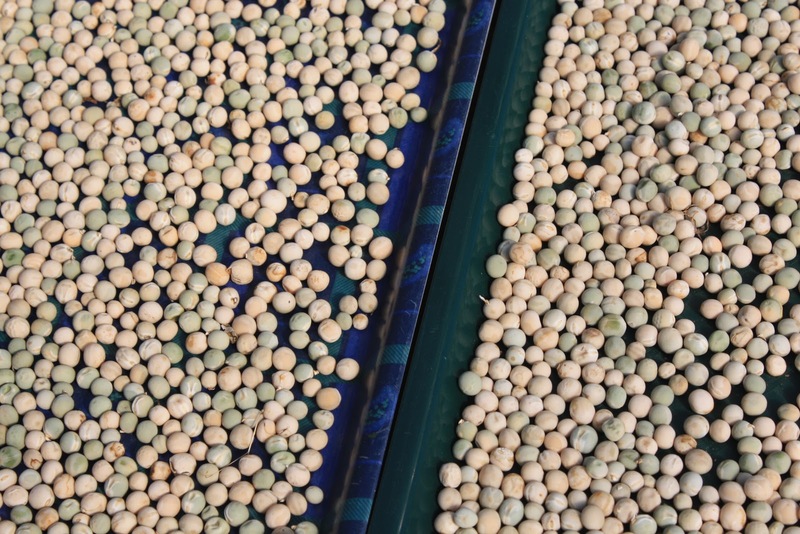 Plus the crop will develop over time, year after year, adapting to the conditions of our farm. 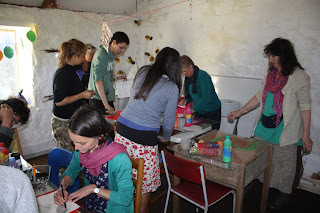 This coming weekend we are hosting three workshops in the Hive. First of all, on Saturday 13th from 4 till 5pm, Alice will be leading a Spanish workshop (donations to the farm welcome). 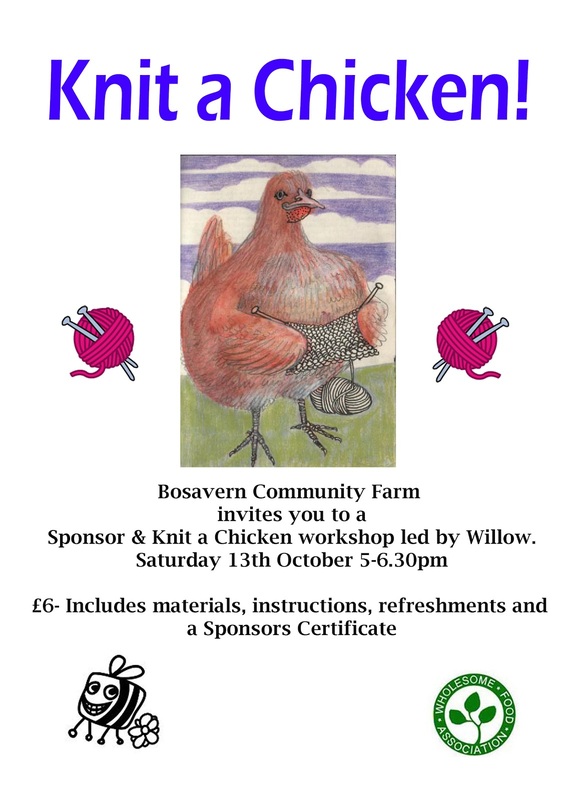 Secondly, following the Spanish, Willow will be leading a Knit A Chicken workshop from 5 till 6:30pm, at a cost of £6 per person, including all materials and a chicken sponsorship certificate. Thirdly, on Sunday 14th, Sonja will be leading the first of a series of Yoga workshops (donations to the farm welcome). These workshops are open to all, so please come along. Dorothea, from California, left us on Tuesday after two weeks as a wwoof volunteer - many thanks for all your help, and enjoy the rest of your time in Edinburgh. Ellie during the hay harvest. 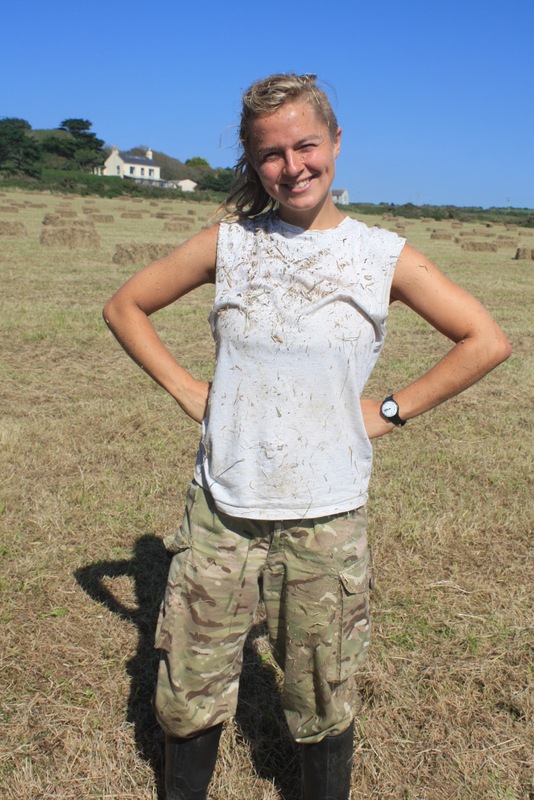 Ellie left us yesterday morning after one month as a wwoofer on the community farm, off to volunteer on two other farms in Cornwall. 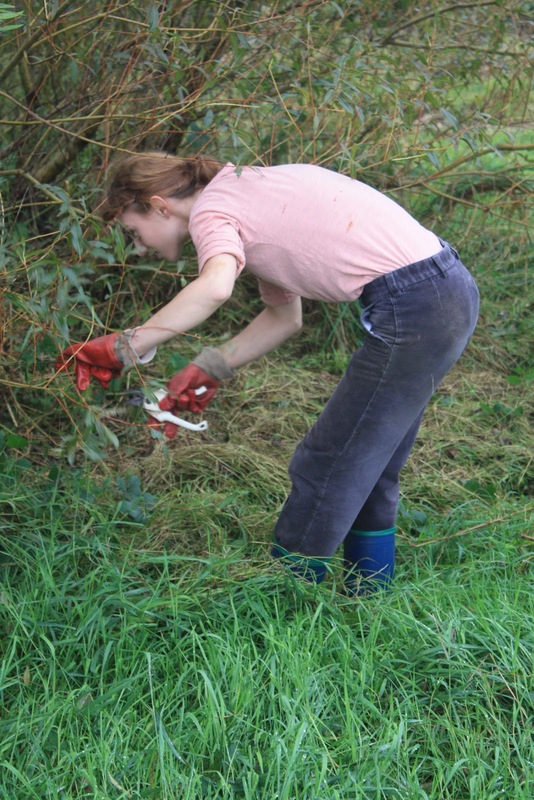 We hope she will be returning to Bosavern for the first week or ten days of November (to run another "Art on the Farm" workshop), but until then, many thanks for your hard work and enjoy your other wwoof farms. 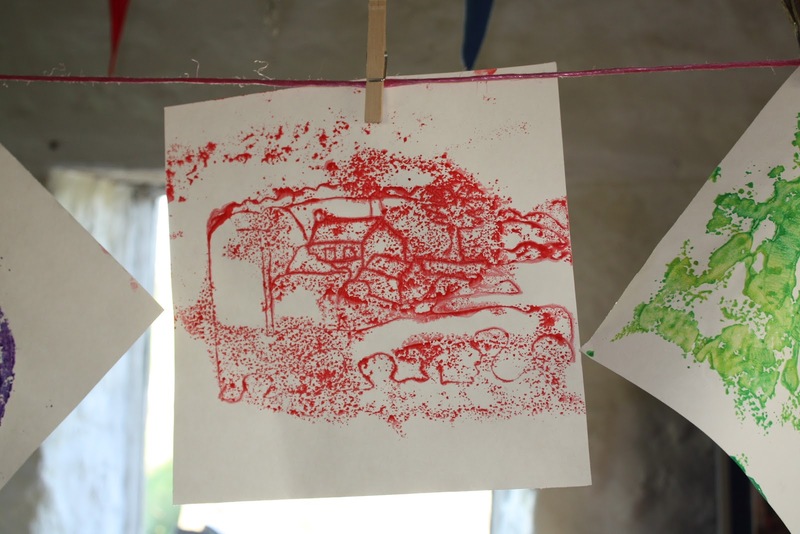 Art on the Farm workshop. On Saturday 29th September, we held an "Art on the Farm" workshop in the Hive, from 5 till 6:30pm, led by one of our wwoofers Ellie. Ellie showing how to monoprint using perspex sheets. A monoprint of the farm hung up to dry. We hope that Ellie will be back to lead a follow-up workshop on the first Saturday in November - please watch this space for details. 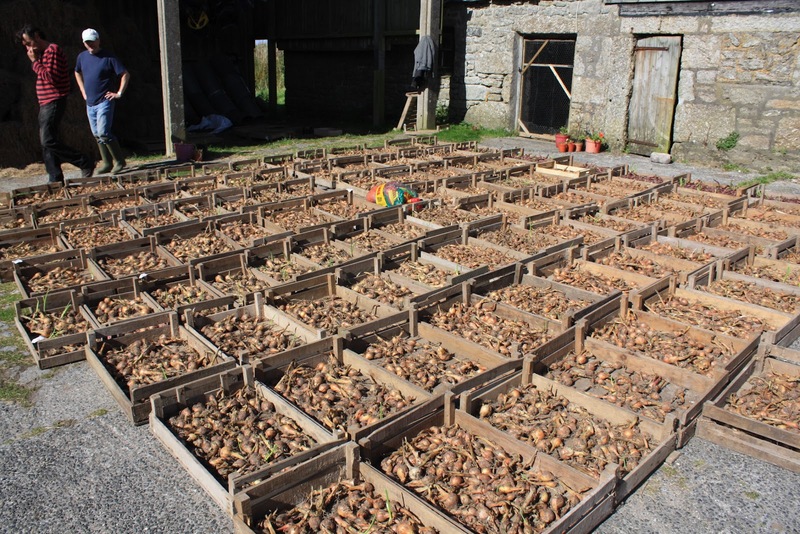 After stacking our onion harvest in wooden trays in the open barn for three weeks to dry them, on a lovely hot (rare) sunny Saturday we brought them all out, sorted through them, discarded the rotten ones, and put them all in sacks to store in the cow shed over winter. 100 trays of onions laid out in the farmyard. Ellie, Simon, Jonathan and Jim sorting and sacking. 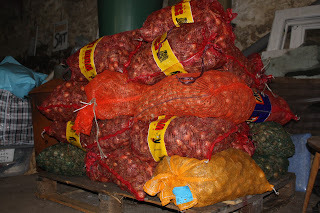 A winter's supply of onions.